Montana CRACKLE Effect Spray for the special crackle-look (e.g. for a vintage or used-look). Prior coating of your object is necessary with colors of Montana GOLD (recommended) or Montana WHITE (the thicker the base coat the stronger the effect). Give at least 45min but not more than 24hours drying time to the base coat before applying CRACKLE effect (drying time might vary due to temperature, humidity and thickness of coating). Apply spray strokes from left to right in a crossing over motion (cross-coating) for best results. After extensively applying CRACKLE Effect to your primed area, the distressing (cracking) process will begin to occur. 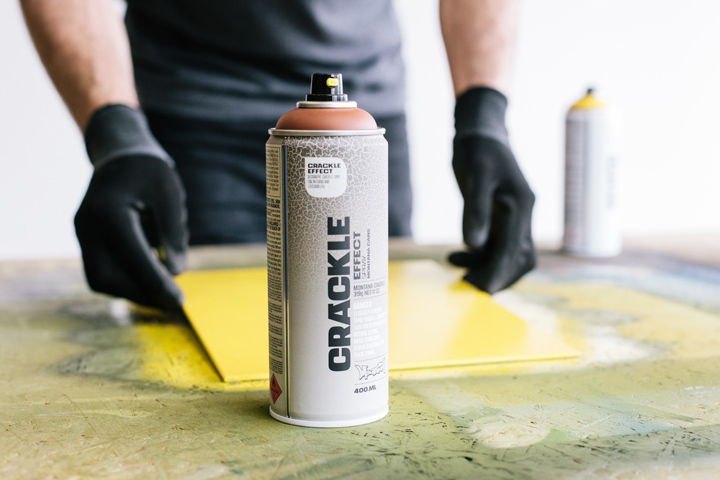 The CRACKLE spray is high-covering and can be top-coated when fully dry and cured (after 24h) with Montana GOLD, Montana BLACK, Montana WHITE, Montana ACRYLIC markers as well as customary acrylic paints. Pre Priming with Montana Styrofoam primer is required for application on polystyrene (make sure to seal the surface completely). Color shown on top or donut. USE: Recommended working temperature is between +10°C und +25°C. During application, protect the object and the surrounding area from spray mist. Surfaces should be dry, clean of dust, oils and rust before varnish application. Shake can well for 2-3 minutes upside down to take advantage of gravity. Remove the safety ring by removing the nozzle and turning the can upside down allowing it to fall out. To achieve greater crackling effects, further application can be applied after 5 minutes. Always test spray on a non-visible area to check compatibility of lacquer or paint. Available in the following colors: gentian blue (RAL 5010), patina green (RAL 6000), squirrel grey (RAL 7000), copper brown (RAL 8004), pure white (RAL 9010) and traffic black (RAL 9017).